Rationalist Judaism: Aren't You Scared? Aren’t you scared to support tinkering with the single greatest protection there can possibly be against that threat? Um, no. Charedim themselves, including Gedolim, didn't consider the Torah study of charedi yeshivos sufficient to provide protection against missiles from Gaza on par with Iron Dome. Whereas the residents of the South mostly stayed during Cast Lead (as did the hesder yeshivos), the charedi yeshivos - including Grodna, Petersburg, Belz and Ger - fled from the South. Aren't you scared to be trusting the Torah study of charedi yeshivos to provide meaningful protection from Iran, when the Gedolim don't even believe that it provides meaningful protection from Gaza? Mr. Kobre, I have a similar question for you. Aren't you scared to be putting national security decisions in the hands of the types of people that told their followers to ignore Jabotinsky and to stay in Europe in the 1930s, leading them be massacred by the Nazis? Aren't you scared to be taking direction from people whose interpretation of Torah leads them to deny factual reality, such as insisting that there was no age of the dinosaurs but there is such a thing as spontaneous generation? Aren't you scared to place your connection to God and Sinai with people who are so out of sync with the philosophy of the Rishonim that they take positions that are diametrically opposed to them, again and again and again and again? Aren't you scared to be putting your trust in a system of rabbinic authority which caused Gaza to be sold out for 290 million shekels, Leib Tropper to be given immense power, and the monster Elior Chen to be declared a righteous person? I'd be scared. That's why I'd rather take guidance from the Torah, Chazal, the Rishonim, and Rabbanim with a rationalist outlook, and whose worldview has Klal Yisrael consciousness, relating to the concerns of the entire nation rather than to the narrow interests of a seceded sector of society. Thanks for summing up the situation so nicely. The following story really drives home your point about how the Gedolim completely misread the situation in Europe in the late 1930s. For more see What did R' Aharon Kotler advise talmidim to do before WWII? Maranan verabbanan hold that protesting other Jews in front of the rest of the world can cost you your olam haba. Back in the 1950s, when the issue was drafting women, R' JB Solovetchik read from the Rambam, Hil' Teshuvah 3:11 to show that such separation from the bulk of the Jewish nation is cause for losing one's portion in the olam haba. Even if one isn't sinning, or is in fact doing more mitzvos than those he is divorcing himself from. On the topic of relying on daas Torah, it's not just the Holocaust for which that failed. It was also refusing to support Zionism, the institution that ended up enabling more Torah study and observance than any other in history. It's refusing to protest on behalf of Soviet Jewry, which we now know (with hindsight and opened KGB records) hastened releases and even played a role in the fall of the USSR. 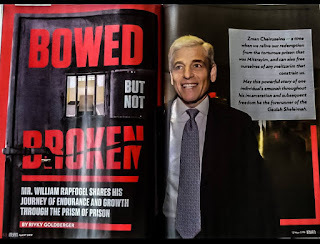 (Okay, not a major role, but still...) It's choosing to protest when a Pollard, Rubashkin, or three bachurim in Japan are imprisoned, even though the last thing a judiciary wants to do is show itself as unjustly bowing to political pressure. Guilt or no guilt aside, the tactic made things worse for the people the gedolim are trying to get released. Frankly, I can't think of a single communal issue daas Torah got right. I am not saying I would do better, I'm speaking with hindsight. But then, I'm not the one claiming I have a gift. Your posts are getting more hate filled every day. Whether or not you are correct in your claims and (sometimes uninformed and naive) views, you really should seek qualified help before you self destruct with all this hatred and venom. How about a positive, intellectual posting every now and then? Controversy and rantings about the terrible society that has disowned you might get you more readers, but it can't be good for your soul - you should definitely get therapy for all your issues. One could add the completely ludicrous farrago when the Haredi world decided a drug addict who shot a police officer died "al Kiddush Hashem" and deserved relase because he put on tefillin in prison or something. The best thing one can say about Haredi gedolim is that they are extremely pious men whose sincere dedication to an ascetic life of Torah study is an inspiration, but who are not really 100% with it, are poorly informed about the outside world and have numerous incorrect views that lead them to make bad decisions. This is true eg. of Rav Shteinman. There are others, frankly, who one cannot say even that of. There are some who are actually quite bad people. I'd rather outsource our decision making to the first 10 names in the Boston phone-book, to borrow a phrase. What's lost in all this is that Kobre, Rosenblum, Shafran, et al are not supportive of their Gedolim but rather of the image of their Gedolim they see as ideal. One wonders what would happen if Ravs Shteinman or Kanievsky would come out with a psak that was at odds with the "official line". Would the psak be publicized or buried because it doesn't fit the preconceived image? This is like two people arguing the shortest distance between 2 points when one believes the world is flat (straight line) and the other that it is a sphere (great circle). Logical proofs are of little value when you can't agree on the axioms. Yes all these things are terrifying. "you should definitely get therapy for all your issues." Perhaps the best therapy for dealing with the insanity and perversion of our beautiful religion is to vent our frustrations in the company of friends. You should know better: Rabbi Slifkin is speaking for so many of us who are sick and tired of seeing our Holy Torah and mesorah so blatantly corrupted by the broader Charedei world. It seems to me that the educated professional types like Eytan Kobre suffer the worst forms of cognitive dissonance in the charedi world. It is almost schizophrenic in a way. they are probably also the most dangerous when it comes to recuriting for the charedi cult (which is colloquially known as finding people to become chozrim b'tshuva). From ME, not from "our midst". There is a difference between Chochma (wisdom) and Nevuah (prophecy). Which does he claim that the Gedolim have? You know, I've always said that when Nevuah actually does come back, we will have our hands full with false prophets. I did not expect that this would happen even before it came back. We're told that while Moshe got the Torah direct from Hashem and the books of Neviim were written with, well, Nevuah (hence the name), the Ketuvim were written with "Ruach HaKodesh." If that's the case, then Ruach HaKodesh hasn't existed since, at the most, the canon of Tanach was sealed. That's the year 100 CE or so at the latest. Sure, we sometimes see claims that Yehuda HaNasi or Rashi had Ruach HaKodesh. But those people come along a handful of times, if that, a millennium. And I can name a dozen people off the top of my head from the second half of the 1700's alone who rank higher than any modern gedolim. So how on earth can Kobre blithley state that "ruach hakodesh" applies today? To make it worse, of course, the line is referring to *Hashem's* Ruach HaKodesh! It has nothing to do with human beings! To say otherwise is idolatry, but we've crossed that line a long time ago. Rabbi Wein's piece is excellent. But sadly he uses the term "Orthodox" as opposed to "Charedi" and in this respect paints huge swaths of Orthodoxy with his brush - when in reality much of what he writes is really only applicable to the charedi cult portion of Orthodoxy. Sure there were "modern orthodox" leaders in pre-WWII Europe who were also opposed to Zionism and hounded Jabotinsky for alarming the people. And sure there are modern-orthodox people who today are anti-zionist and live in a cognitive dissonant reality hoping or thinking the State of Israel will disappear (the NY times gave them prominent coverage recently). and sure there are some charedi-leumi folks who are against secular studies and such. But on the whole most of what Rabbi Wein writes about applies ONLY to the charedi cult. Not other groups. Don't fall into the trap of attacking on other people's opinions. You've been doing that an awful lot lately. You have to promote your own view, and let others worry about attacking you. An occasional commentary is warranted, but mostly that just serves to make you seem combative, and make those you attack seem more important than they are. Having said that - boy, does R. Wein ever hit the nail on the head. I write this piece with sadness. Sadness because 5 years ago I was one of the many people who had great hopes invested in you as a force which would lead Charedi Judasim away from the abyss. And then you write this. Everything you said is undoubtedly totally true but also undoubtedly self indulgent. Self indulgent because your self professed mission of "doing kiruv" in Beit Shemesh isn't going to be helped when you blaspheme against Charedi false gods. People need a degree of immanence, need miracle workers, need totemic figures; and all you offer them is cynicism and uncertainty. As a case in point, why the bizarre attack on prayers for the dead at your own mother in laws shloshim? Isn't Judaism about providing meaning, compassion and comfort for the living? Doesn't Halacha evolve over time? Who cares whether Kaddish was originally instituted for tziduk hadin - as beis din d'shoru moshcha found out humanity carves out a very authentic reality of its own. Why are you fighting with humanity? This recent blast of rhetoric may have been deeply cathartic to write but its infantile inability to deal with the human condition underlines why Modern Orthodox Judaism is withering away on the vine. With your dry hyper rationalism and your inability to see a bigger picture you are in danger of inventing not a Rationalist Judaism but a Calvinist Judaism; and in your literalism and inability to build bridges I fear you are becoming the Fred Phelps of Beit Shemesh - angry, offensive and irrelevant. It's so sad. I'm with DF. If I were you, I would not have bothered responding to Kobre. Moreover, all the points you make, while I agree with them, you have made before. This post comes out sounding, as DF wrote, too combative. It is not one of your best posts. R Wein is a legend. Of course he is largely referring to charedim, but wisely does not say so in as many words. Having said that, his viewpoint is entirely antithetical to that of charedi jewry. The charedi party line is very much "listen to the gedolim no matter what they say". as such, any statement by a gadol pre-war that said stay in Europe vs. going to USA / Israel must necessarily have been correct. Had the person disobeyed ultimately he would no doubt have gone off the derech, a fate far worse than death al Kiddush Hashem etc. I must say though, that I do agree with DF et al. I have no doubt that this post is music to your core supporters, however to the kinda fence sitters like me it largely sounds vitriolic. I really would like to see more posts on your core areas of rationalis Judaism, chazal and science etc. you bet I'm scared! That secularly educated, fluently writing, pseudo-intellectual charedi wannabees of the Kobre/Rosenbloom ilk can be so immersed in self denial, fantasy and irrational argumentation. To Sad Moniker, Lawrence Kaplan and others: You may be correct that Rabbi Slifkin sometimes goes far afield and I, too, at times detect traces of hyperbole in his writings but I fully understand him. If you would be vilified by certain circles as being an "apikores" and a "rosho", if you would have your books , upon which you spent so much time and effort, banned because of some imaginary heretic bent, if you would be cast as the chief heretic by Rabbonim, with those same Rabbonim having praised you in writing ,you would be a little bit sensitive too! As far as the main point of the entry- I agree with many posters that this is actually a very important debate. It lies at the root of everything. Is there indeed an obligation to listen to "daas torah", regardless of its merits? It permeates everything, from the discussion on the draft and mass kollel, on the need for some amount of secular education, on the place of the state of Israel in our tradition, on everything actually. The very sad part is that many of us- maybe even including Rabbi Wein!-will be branded "apikorsim" for raising the issue of this new pseudo-religion- "daas Torah"! Chareidi thought cannot survive a rational analysis of the Holocaust, the establishment of Israel, the bankruptcy of the Israeli kollel model and many others. Therefore, ergo, you cannot debate it and any critical review makes you an apikores. If real debate would be allowed, how many of the gullible masses would continue this path? If you would be vilified by certain circles as being an "apikores" and a "rosho", if you would have your books, upon which you spent so much time and effort, banned because of some imaginary heretic bent, if you would be cast as the chief heretic by Rabbonim, with those same Rabbonim having praised you in writing, you would be a little bit sensitive too! R' Yoni said "I have no doubt that this post is music to your core supporters, however to the kinda fence sitters like me "
Perhaps you could expand on this a bit, what does it mean to be a fence sitter when reacting to a statement like, "When all the smoke clears from the battlefield of rhetorical jousting and endless punditry, this really isn’t about the views of Yonoson Rosenblum or Eytan Kobre versus those of any other Jew of whatever stripe. It is about what maranan v’rabbanan, the leaders of our generation — those about whom we beseech Hashem with the words v’ruach kodshecha al tikach mimenu, please don’t remove ruach hakodesh from our midst — have said and done, "
How does one sit on the fence of the question of whether one must follow the words of maranan v'rabbanan? Coming up in the next post: A discussion regarding rationalist vs. mystical Judaism - as it relates to the mechanism of Torah providing protection. R Berel Wein's article crystallized what was always preached by my Rebbi's during my Yeshiva years - that all good things can be attributed to Torah learning. The Charaidim are fighting for legitimacy, vis a vis the success of the State of Israel. The fear of the Chariaidi world is that the implementation of the new law will be successful or even benign and can put into question their heavy Torah / "Gedoylym knows best" centric world view. Until now they can claim that the Torah study influenced the success of the state through their Torah learning. The new law can potentially marginalize such rhetoric or even worse indict them for not participating in social service in the past. Their whole ideology is being put on the line - damn straight they are scared. Jabotinsky's group was relatively tiny. Almost all Jews, of all types, rationally thought they could ride out the storm, as they had done countless times. No one dreamed of the unthinkable that became reality. Quite simply I logically agree with much of what R' Slifkin and even more of what R' Wein writes. It seems to me ludicrous that such a huge segment of Israel's population pretty much wants to just ignore the facts on the ground. However at the same time I have some sympathy for R' Kobre and his ilk who point out that they have not made this ideological position up themselves but have relied on the 'psak' of a large number of people who by all accounts are very well versed in pretty much kol hatorah kulo. My fence sitting probably has much to do with my upbringing which was what I can only term as anglo-semi-charedi, i.e. following the charedi party line to a large extent. "have relied on the 'psak' of a large number of people who by all accounts are very well versed in pretty much kol hatorah kulo." Ay, there's the rub. I recommend that you read my monographs on "The Sun's Path at Night," "Shiluach HaKein" and "What Can One Do For Someone Who Has Passed Away?" Then you'll see if these people are really reflecting classical Judaism. Please do not associate Eytan Kobre with Yonasan Rosenblum. They are both spokesmen for the Chareidi community, but they couldn't be more different. Kobre is a blind fanatic, who uses his talents and forum only to promote official party POV (often in a snarky way), while Rosenblum is frequently critical of said POV. Kobre deserves evertyhing that has been thrown at him in this blog, but Rosenblum deserves our admiration. Interesting argument, Sad Moniker. One especially likes the "Calvinist Judaism" quip. And Temujin wonders what the Hebrew, Aramaic or Yiddish equivalent of sola scriptura might be. First of all, a reality check: Are you not shocked and disgusted at Aytan Kobre's unsavoury, mendacious and cheap fear-mongering? Rabbi SLifkin points to problems with Kobre's logic, but one would argue that actually no, the logic is sound...too sound for creating fear which is aim...it's the ethics that stink. In one stroke Kobre attacks the credibility of millions of Jews and the that of the Jewish State which defends and sustains his friends...a rather familiar leitmotif by now, no? You argue that "people need a degree of immanence, need miracle workers, need totemic figures; and all you [i.e., R'Slifkin] offer them is cynicism and uncertainty. Hold on, think about this; R'Slifkin cannot be the one and only thinker to drive Rationalist Judaism without the movement falling into the same dysfunctional trap-holes as the Haredi sectarians have with their reliance on charismatic leaders. All thinkers have strong characters which appeal to some and rub others the wrong way; they cannot be polished bureaucrats or smiling diplomats and actually get something accomplished. It's also up to the "laity"...you, others and especially the Great Temujin...but also other rabbis and intellectuals to explain, to differ, to soften or stiffen, to encourage, provide different approaches, reveal other facets and so on. You know also that clarity of position on dogma is necessary. And also that the sole alternative to immanence, miracles and totemic figures is not cold cynicism. Most of the folks here, including you, are well aware of the depth of rationalist philosophies, understand the hashkafa and the mission, and need not have your hand held at the sounds of the first scuffle. That nervousness about R'Slifkin's approach which comes up now and again is certainly understandable, but hold it up against the current context, not an ideal scenario in calm times. There is a historically unique and decisive religio-political-philosophical conflict taking place as we speak and it would be a kind of a "dereliction of duty" for everyone, including and perhaps especially R'Slifkin, to surrender the high ground at this time to sneaky chaps like Mr Kobre. This is why Temujin unabashedly doffs his cap and offers his unreserved compliments to Rav Slifkin on this latest post of his; it is to the point and directly addresses a serious challenge. Yes, there are many ways to do this and someone will always say, "Oh, but look, so-and-so did it this way." But that's not the point or the ultimate solution. Someone must provide a vigorous, real time and to-the-point response to specific conflicts...and some are better at it than others. We all do what we can, so, let's not grow faint-of-heart just yet, but khazak, khazak, what? An additional point: Palestine was not exactly a safe haven during World War II. But for some unforeseeable and fortuitous events, it would have gone the same way as Europe---Rommel would have taken it, and the Grand Mufti of Jerusalem would have operated the gas chambers.The Grand Mufti's desire to kill all Jews was not a secret, throughout the 1930 and 1940s. Just because this was not the final result doesn't make it a more rational choice for those who didn't have the benefit of hindsight. It could be argued that moving to Palestine was not much more of a rational choice than staying in Europe. I have read all of the above, but I don't think any of that in any way alters my statements above. The point is not that you have some logical and seemingly justifiable points but that there are clearly a large number of people well versed in torah who not only disagree with your conclusions but disagree that there is any validity to your arguments at all. I am really not trying to compare like for like, but just as an illustration, the arguments of many Bible critics etc. sound extremely convincing to me yet I don't in any way believe their opinion to be the Torah viewpoint (they think that their opinion really is the viewpoint of the *original* Torah). Similarly while you make some very good points to justify your interpretation of the Rishonim's (and Chazal's) opinion simply by labelling these views as heretical allows charedim to justify their viewpoint with less logic (granting for a moment that those opinions are less logical). Anonymous (Andy), but that wasn't the only choice at the time. The Hareidi leadership was ordering Jews to stay put, to stay away from Palestine and avoid evil America and the membership was going about the impoverished towns and villages seeking funds with which to open even more yeshivot and publishing sublime books on Mussar. This whilst the Wehrmacht's Panzers and Sonderkommandos were grinding their way towards Poland. Picking up a Yiddish newspaper may have made the difference. TY for the response. ISTM that from what I have read there are some in the chareidi community who do not believe in the form of daas torah described by R' Kobre (e.g. they have internet access for non business usage) but still feel most at home in the chareidi community. I wonder if the cognitive dissonance is resolved by ignoring it or feeling that they should believe in daas torah but are weak or some other manner? Yoni, you have to realize that these people have a deeply anti-rationalist outlook that colors all their opinions. You can see how much they are at odds with classical Jewish thought very easily with the Pesachim 94b test (about the sun's path at night). Ask them how they understand the Gemara, and ask them if that is the normative understanding. Then compare that with how the Rishonim actually explain it. It's all very well saying that these people "don't consider my arguments to have any validity," but if they are incapable of rationally explaining why, then their opinions are not worth very much. I dont get it. You agree that there are sources in the gemara for Torah bringing protection albeit its "scattered"
You also agree that at the moment the IDF do not need the extra manpower, yet you claim that still, the haredim should share in the burden as why should only the hilonim put themselves in line of fire. So why have you been lately taking off you rationalist coat and instead donning your highly charged emotional frock? I will be giving one answer to your question in tomorrow's post, where I will explain one reason why the protection that the Gemara talks about does not apply in this case. Another answer is as follows: Any protection that they provide is clearly minimal at best. This has to be weighed against the enormous harm to society (and chillul Hashem) of an entire community refusing to share in the burden of military service. Or, those who believe that they do kiruv see themselves as "special agents" with a real or assumed license or dispensation from the strictures applied to the hoi polloi..."the multitude." The human mind is a marvelous thing. Have you ever read the Almagest? I highly recommend it. http://en.wikipedia.org/wiki/Hoi_polloi#Usage. I once spoke with a prominent Rosh Yeshiva and asked for his response to the assertion that the Gedolim were wrong for not encouraging the Jews of Europe to escape to Palestine in the 30's. His response (or my approximation): "Have you ever looked at a map!? Do you think that we are safe here? Don't you realize that there can Chalila be a Holocaust here in 10 minutes' time? It is a fact that the original Zionists intended Israel to be a 'safe haven', where Jews would not be endangered, a plan which today is a sad joke. Chaim Weizman, when asked his plan for the Arabs, responded: 'they are just a small group of nomads - they won't cause any problem at all.' (this quote is in a biography of Weizman. In other words, it's a little too soon to judge history, and determine with certainty who was right and who was wrong. The Roshei Yeshiva and Chassidic rebbes have against all odds done the impossible - they have rebuilt a world from the ashes - you can disagree with their approach, but to pretend here that they are all fools is just plain silly. Ok will wait for tommorrows post. Your second line i fail to understand. If haredis offer minimal protection, and its the type of protection that hilonim cannot offer, logic dictates that the State will be getting the most of its human resources if the hilonim take the uzi and the haredi the gemara. Your view that haredim enlist and therefore some hilonim can be relieved is wasting valuable resources. "Temujin said...The Hareidi leadership was ordering Jews to stay put, to stay away from Palestine and avoid evil America and the membership was going about the impoverished towns and villages seeking funds with which to open even more yeshivot and publishing sublime books on Mussar. This whilst the Wehrmacht's Panzers and Sonderkommandos were grinding their way towards Poland. Picking up a Yiddish newspaper may have made the difference." One shudders at the prospect of taking on the Great Temujin. But, alas, one must. Jabotinsky advised moving to Palestine, not America. As I noted, Palestine was arguably not much more of a rational choice. So I'm not sure it's fair to fault the rabbis for not listening to Jabotinsky, as R' Slifkin appeared to do. The people who regularly read Yiddish newspapers died in probably nearly the same proportions as those Orthodox who did not. So I don't think that would have saved them. If you want to fault Jews who believed it best to stay in Europe, it is only fair to fault (almost)ALL European Jews; why single out the rabbis? I can't speak for anyone else, but to the extent that I agree with the daas torah approach I would say that my answer would be the being weak option. I don't think that really adds much. At the end of the day we have to believe some pretty irrational things in order to accept Judaism; I think that you agree with this to some extent (you did a post on it once). For charedim that simply goes several steps further, e.g. to R' Meiselman's approach. I certainly agree that when *I* read the gemorah (even forgetting about rishonim for a second) I find it hard to accept anything other than the plain meaning of the words. Left to my own devices I would certainly come to the conclusion that the amoraim et al believed in a geocentric model as well as many other more intrinsic scientific impossibilities. However none of this changes that this is very much not what the gedolim feel they believed. The charedi viewpoint is simply that if you don't believe their explanation to be rational then you simply have not understood it properly or are not being rational yourself, go and learn. If you still don't understand then go and learn some more etc. Surely you understand this from your years in charedi yeshivas? That is really the crux of Kobre's argument. It really is an argument from authority and the strength of anyone's acceptance of the argument will be directly proportional to the degree that they accept the authority of the gedolim. The great part of the argument is that the more you argue against it the more its proponents can point out that you are not following the "Torah true" approach of subjugating yourself to the authority of the gedolie hador. You can shout to the skies that that is not the Torah true approach, but all you achieve is further entrenching their view of you as a kofer baTorah. This is really why I originally said that these sort of posts sit well with your fans (those who already fully accept the premise that you don't need to follow the gedolim's approach) but don't sit well with people on the fence. The part of us that is already sympathetic to your premise accepts these posts as further evidence of said premise, but the part of us that accepts Eitan Kobre's arguments find posts like this as merely reinforcing the view that your entire premise is faulty. Being a rationalist isn't the same as being a Mr Spock analogue and rationalism balanced with passion (or the other way) isn't such a bad characteristic. Yoni, based on the bulk of your last comment, I'm not clear as to why you're on the fence at all. Curious arguments you make, Andrew. The inferiority of Haredim as useful soldiers, a human resources-oriented view about practical divisions of services and of course, economics. But things do come to a rather stark moral and philosophical head as Mrs ChanaRachel's paratrooper son gets on a train for his base with her sandwich for his Purim seu'da squished among his gear and sofrim, while her neighbour's son heads for the bet medresh and then a cheerful meal with his friends or family. Not just once, or twice...but always and as a matter of guaranteed privilege. This really isn't about results-oriented social engineering challenges; it's about fairness, self-sacrifice, Jewish unity, tradition and halakhah. Andy asked: "If you want to fault Jews who believed it best to stay in Europe, it is only fair to fault (almost) ALL European Jews; why single out the rabbis?" Although I admit a number of commentors sound angry, blame is not really the central issue. The question of whether or not daas Torah is a real phenomenon, that rabbis have some kind of ruach haqodesh (Divine Inspiration) or that learning shaped their minds in a way that gives them supernal insight, one has to deal with the question of why the rabbis people turned to during WWII didn't do any better at advising than those who lack daas Torah. I should point out that some models of daas Torah, eg R' Dovid Cohen's of Gevul Yaavetz, are prescriptive, not descriptive. RDC writes that we have a halachic obligation to make the rabbinate our communal leadership. But with no claim that this will help us obtain our desired goals. R' JB Soloveitchik, before the Shoah estranged him from the Agudah and its philosophy, made a similar statement in his eulogy for R CO Grozhinsky, "HaTzitz vehaChoshen". The head of the Kohein Gadol (and the mashuach milchamah, the head kohanic military chaplain) bearing the tzitz on his forehead with the words "Qodesh Lasheim" (holy to G-d) must be the same person who carries the names of the tribes of Israel on the choshen on his heart. A metaphor in which RYBS poetically argues for a unity of religious and communal leadership. And a position RYBS abandons. As he explains in the essay "Joseph and his Brothers", through His Hand of history, G-d "rulend against the Agudah and in favor of Mizrachi. "Charedim themselves, including Gedolim, didn't consider the Torah study of charedi yeshivos sufficient to provide protection against missiles from Gaza on par with Iron Dome." You have made this argument many, many times. It is essentially childish. Israel is a lone sheep surrounded by 70 wolves. There is no way bederech hateva it could have survived as long as it has, or been victorious in its wars -- especially the Six Day War -- without miracles. It is the Torah learning that provides that Divine protection. Even at the height of our glory, when the gemara says that Yoav the general enabled Dovid Hamelech to learn Torah, and Dovid's Torah learning enabled Yoav to win military victories -- even then there were people who died in battle. And Dovid Hamelech himself fled on several occasions, fearing for his life, rather than just sit calmly in one place learning Torah while Shaul's soldiers looked to kill him. He feared he lacked zechuyos, and certainly any given yeshiva student may similarly fear that his personal zechus is not enough to protect him personally at a moment of grave danger. Getting out of the way is the prudent thing to do. If a man doesn't think his Gemara is a personal bullet-proof shield, that means he doesn't believe in the very concept of Divine protection or Hashgacha Pratis?! The protection is for the people as a whole, for the whole land -- it is not a guarantee of Superman-invulnerability to bullets. And the protection extends not only to those who learn Torah but to all the Jews in the country, especially those who support Torah -- even those who support it unwillingly and with hatred and resentment in their hearts. However, not every single individual is guaranteed divine immunity from the vicissitudes of life. I personally believe that the Torah learning of anyone who learns Torah affords protection to everyone around him, and I very much include the Torah learning of the hesder guys, whom I view as heroes. I saw in my home growing up that ohavei haTorah love and honor each other, even when they disagree strongly about this or that hashkafa or this or that policy. Mrs. Katz, with respect, you have failed to understand my arguments. "The protection is for the people as a whole, for the whole land"
No, the traditional sources discussing it are very clear that it is focused on the city where the person is. The Chazon Ish and others agree. Nobody thinks that anyone thinks that it provides bulletproof immunity. But the charedim are claiming that it helps. If so, and if this is what the boys are doing instead of army, then they should be providing this protection even at some personal risk to themselves, just as soldiers do. Anonymous Andy, greetings. It's alright, Temujin has had his lunch. At issue is not whether it was reasonable to assume that the "troubles with the Germans" would blow over or not. It was reasonable to dismiss danger; skepticism over war propaganda and memories of those who remembered the gentlemanly German officers...with Jews among hem even... in WW I and such. And it wasn't only the Hareidim who were hopeful, of course; there were plenty of "cultured" middle class, German-speaking Jews who saw themselves as immune or even indispensable due to their social station or special talents. At issue is the Hareidi claim that their leadership had and still has special authority and abilities to predict and change history. This when tens of thousands of ordinary Jews either saw the proverbial writing on the wall or (luckily) imagined a looming disaster and did everything to get out. Even more astounding is the claim one has come across in several Agudah "histories" that all would have gone well, as their Gedolim predicted, that they would have bought off the Goyim as in the past, had it not been for the evil seculars, Zionists, Bundists and communists. The irony, of course, is that it was precisely those awful characters who actually saved the greatest number of Jews by getting them out to Russia or Palestine and along the way managed to put together the first Jewish state since the destruction of the bet hamikdash. * because I'm not sure how Torah study is going to stop Iran from wiping out the Jewish people, whilst the western powers appease in a Chamberlain type way this state, of 50 million people, which is governed by a clique of religious nutters. *I watch how secular Arab nationalism (bad enough) is being replaced not with democracy but with fanatical Jihadism, which will eventually unite the Sunni-Shia Islamic splits. *after the states surrounding Israel have ethnically cleansed their territories of non-Muslims and keep their ramshackle states together via hatred of Israel, they'll declare war (that's if Iran hasn't beaten them to it). * because 10% of Israeli society REFUSES TO LIFT A FINGER to do anything about the above set of crises and instead simply wishes to take, take, take, take from the very state that they detest and refuse to serve in and let everyone else do the heavy lifting- militarily or economically. BUT, what makes me NOT scared because the other 90% of Israeli society is prepared to knuckle down, get real, make real sacrifices, by doing the military service in the IDF and providing real,actual protection to the state of Israel and her citizens. "Micha Berger said...The question of whether or not daas Torah is a real phenomenon, that rabbis have some kind of ruach haqodesh (Divine Inspiration) or that learning shaped their minds in a way that gives them supernal insight, one has to deal with the question of why the rabbis people turned to during WWII didn't do any better at advising than those who lack daas Torah." Agreed. But the Holocaust also weakened (or should have weakened) belief in the polar opposite of Daas Torah as well---the ideally pure cold calculations of those who believe in nothing but scientific cause and effect; or, those who believe in the the greatness of humanity (humanists). These people are no less confident in their approach than believers in Daas Torah are in their's. And they as well by and large stayed in Europe. And died in Europe. The Holocaust was one big disillusionment for all Jews of all beliefs (Jabotinsky excepted). Why single out the rabbis and Daas Torah as the only ones who have to be called to account? Because Kobre was claiming that we should be scared and humbled to challenge their divinely-inspired leadership! I am really curious as to which side of the fence you think my commens indicate I am (should be) on and why. The side where other people agree with your statements that the charedi approach is vastly less rational and is based on arguments from authority rather than from reason.
" And sure there are modern-orthodox people who today are anti-zionist and live in a cognitive dissonant reality hoping or thinking the State of Israel will disappear"
I live in a modern orthodox community in the US and while there are varying degrees of Zionist fervor, I do not know a single observant modern orthodox Jew who is hoping that the State of Israel will disappear.
" People need a degree of immanence, need miracle workers, need totemic figures"
"and all you offer them is cynicism and uncertainty." Actually the world is full of uncertainty. It is no exaggeration to say that I have a PhD in the quantification of uncertainty. The Torah was not given to create a false sense of certainty but to allow us to navigate a confusing and uncertain world in a sane manner. No human has come up with anything better. "Modern Orthodox Judaism is withering away on the vine"
In my neighborhood the modern orthodox synagogues are bursting at the seams, as are the modern orthodox schools. We can't build new buildings fast enough to accommodate the growth. "inventing not a Rationalist Judaism but a Calvinist Judaism"
Nobody who knows anything about Calvinism could write that! infinitely more comforting than appeals to a manifestly unsound magical approach. "as far as I know, it was ONLY Jabotinsky who was exhorting Jews to leave Europe"
Arnold Schoenberg, the famous classical music composer, also predicted the Shoah in writing. His views were so unpopular that he could not get that essay published, so his sentiments were known only to his direct acquaintences. In Schoenberg's case he had lived as a gentile for decades. He had an unusual perspective. "Palestine was not exactly a safe haven during World War II. " While Schoenberg did self-identify as a Zionist, his emphasis in 1938 was to get Jews out of Europe ASAP and he did not think to where they were to flee was important at that time. "it's a little too soon to judge history, and determine with certainty who was right and who was wrong. " It is not too soon to say that to tell Jews to stay in Europe in the late 1930s was incredibly bad advice. "R' Slifkin said:..Aren't you scared to be putting national security decisions in the hands of the types of people that told their followers to ignore Jabotinsky and to stay in Europe in the 1930s, leading them be massacred by the Nazis?..." If you use this as the criteria, then you literally can't put national security decisions in the hands of ANYONE---secular, religious, ANYONE. Just about ALL Jews got this one wrong. Right, one can be equally uncertain about any leader. But Kobre was saying the opposite! So your point, by using that criteria, was that we should be equally afraid of ANYONE who makes national security decisions? Or only Chareidim? I find this post wholly appropriate. Kobre and Menken proclaim EXPLICITLY that we are not allowed to form our own opinion about the propriety of the new draft law, even if we base our opinion on our Torah learning. Rather, we must blindly adopt the position of the "Einei HaEida." They then tell us who are the "Einei HaEida": the Chareidi Gedolim. In response, it is perfectly acceptable to point out that these Rabbis have no special insight into human affairs, history, nature, etc., and that it is indeed okay to decline to adopt their position when their position makes no sense to you. These are just a small selection of passages that make Mr. Kobre's writing truly brilliant and remarkable. The basket weaving insult - dynamite! And then, the suggestion that the cover of the magazine was meant to make everyone angry all along... who knew!? And I love how Mr. Kobre compares drafting soldiers as a measure of self-defense to using new-fangled equipment that you got in the mail to perform open-heart surgery. Who else could think of such an irrational yet ingenious comparison. And then finally the nail in the coffin... the stakes are really high so have no choice but to be safe and do everything that I say! Regarding the claim that Eretz Israel was not "safer" than Europe during World War II, I can only say I find it fascinating how pious Jews bend over backwards to find excuses not to live in Eretz Israel. To the historical point, prior to the surprise collapse of France within 6 weeks in 1940, Eretz Israel was actually quite secure and far away from the German Nazi and Soviet monsters. Eretz Israel was a British colony, bordered by British colonies in Transjordan and Egypt and by French Syria and Lebanon. The only Axis territory in the vicinity was Italian Libya, but it was bordered on the east by British Egypt and on the west by French Algeria and Tunisia. Thus, Mussolini wouldn't have dreamed of invading Egypt and marching in the direction of Eretz Israel with the French at his back. Thus, it was reasonable to view Eretz Israel as a safe haven. Of course, the collapse of France did upset things, but the Germans didn't reach Eretz Israel and actually, a cool analysis showed that they really couldn't, Rommel had too few troops and tanks and his supply lines were too long. That is why the British made their stand at El Alamein...those in the know realized they could stop Rommel there. Then , there is the famous story of Rav Herzog who was in New York at the time of Rommel's advance, but he insisted on going back although people tried to convince him not to and his famous reply was that this was the final geulah and it would not be endangered. it really is a pleasure reading anything rabbi wein writes. what a mentsch. "I do not know a single observant modern orthodox Jew who is hoping that the State of Israel will disappear." Look, Charlie, it may not be true for you or me or R' Slifkin. But the fact is that huge numbers of people worldwide are very comfortable with people telling them what to do. Putin really does win elections; so do Islamists. It's not as if the ChiComs and Kims can't gin up mass support if they want. And, sadly, this is true of lots of Jews as well. What about the monster called the Grand Mufti, who was in Berlin, planning with Hitler for gas chambers in Palestine? What about the Jews in Palestine who were preparing for an underground or guerrilla war against the Germans once they invaded? What about the fact that the British had already failed miserably to protect Jews from marauding Arabs? What about the fact that if Britain fell, the British stationed in Palestine might have collaberated, same as Vichy France? Even if the facts are as you say (we obviously have different sources), I don't think an observer at the time, given what limited information he might have had, could be faulted for concluding Palestine was not much safer. Someone commented: "Israel is a lone sheep surrounded by 70 wolves. There is no way bederech hateva it could have survived as long as it has, or been victorious in its wars -- especially the Six Day War -- without miracles. It is the Torah learning that provides that Divine protection." I agree 100%. The victory of the Six Day War can only be described as miraculous. However, how many people were learning full time in 1967? According to Rabbi Yair Hoffman ... 600. @nachum - in fact I believe we all operate on different levels (emotional, spiritual, factua, physicall) at different times. That's not something to be in denial about or ashamed of. To me the key attribute of leadership is balance. Blaming pre war rabbis for the death toll caused by the Holocaust is always going to be divisive whatever the merits of the case (a case that is not straightforward and is complicated by 65 years of hindsight.) It's profoundly poor leadership in this context. I know your mention of Jabotinsky was an aside, but Shmuel Katz in his biography of his hero says that Jabotinsky -- despite what people say -- did not envision a German danger to the Jews. He thought Eastern Europe itself (meaning the Poles, Ukrainians, Lithuanians, etc.) was a powder keg ready to ignite. When he urged Jews to leave, the danger in his mind were Eastern European populations that he believed would not tolerate Jews in their countries in an age of rising nationalism and economic competition. Yes, he did predict a danger for Jews in Eastern Europe. But it wasn't the Nazis he had in mind. "Are you afraid?" I am afraid of any authority that restricts my ability to defend myself. Generally the clergy has not confiscated weapons but your friend the State has, and in Israel the clergy and State are merging, if I understand the situation. The State of Israel is as gun-grabbing as any modern democracy. Down with them. "The only Axis territory in the vicinity was Italian Libya, but it was bordered on the east by British Egypt and on the west by French Algeria and Tunisia. Thus, Mussolini wouldn't have dreamed of invading Egypt and marching in the direction of Eretz Israel with the French at his back." Libya wasn't even at war with Britain until June 10, 1940. The nearest Nazi army was in Poland! Egypt had been an independent sovereign state since 1922. However, the UK had a big naval base at Alexandria and a small army protecting the Suez Canal. Italy would finally attack Egypt in September 1940 but the invasion was a disaster -- despite being outnumbered something like seven to one, the British defending Egypt basically won. A UK counterinvasion made it all the way to Benghazi, destroying what little was left of the Italian army and capturing the city. It was after that that Hitler sent Rommel to North Africa, and we can be thankful that he didn't send enough equipment with Rommel. The Vichy colonial forces were of questionable reliability; in North Africa many of them switched allegiance to the Allies at the first possible moment when the US and UK invaded North Africa in November 1942. In Syria, the invasion went in the other direction, and UK and Free French forces invaded from Palestine in June 1941 and quickly overran Syria and Lebanon. The bottom line is that there was never a Nazi threat to Eretz Yisrael. Had Hitler y"s given Rommel the equipment he needed it is possible, but not certain, that Rommel could have won the North Africa campaign -- and he did give the US military its worse defeat since the American Civil war at Kasserine Pass in Tunisia in February 1943. But the outcome of the war had been determined by then as the Nazis had surrendered at Stalingrad a few weeks earlier. There was really no danger in Eretz Yisrael itself after the Arab revolt had been suppressed in 1939. Rabi Slifkin: I understand that Kobre's article incensed you and agree with your being incensed. But I still think that your post came across as too combative. At the very least, the mere fact that about 1 million Jews look to chareidi gedolim for guidance - fact they are hardly to be blamed for - is perhaps reason enough for Hashem to ensure that on matters of life and death, their advice would be sound. Another way of putting it is that God didn't decide that 6 million Jews should die in the Holocaust because they "mistakenly" listened to the gedolim of the time. (By the way, I don't know if a higher proportion of irreligious Jews than rabbonim predicted the Holocaust. Virtually no one did!) You can't cherry-pick a few comments and conclude that somehow non-frum Jews are MORE knowledgeable the gedolim about what is good for world Jewry. We haven't survived 2,000 years of exile because of people like Jabotinsky . . .
Just some facts:In the Holocaust, the majority of German Jews,you know those assimilated, Torah-less Jews,survived.Only 20 % perished.Same with the French Jews with similar percentages. By contrast,90% of Polish Jews and 80% of Lithuanian Jews perished. Clearly, the bulk of these Jews were G-d fearing and learned Jews, far more than the assimilated German and French Jews. How does that chime with the mantra of Torah protecting us? Additionally, even if one contends that , prior to WWII,the Nazi danger was not understood and that therefore the Gedolim had no direct reason to advise emigration, how does that answer what happened to Hungarian Jewry? That happened in 1944,when the horrors of the death camps was already public, yet there are many stories of Hungarian Rabbis advising worried congregants that all will be well.I am not -choliloh-putting the blame on them but I am saying that , as holy as they might be, they are not all-knowing and prescient. They remain human beings and are far from infallible.Yes,they can be mistaken and one should not forget one's brains when looking at life. The Hafetz Haim made a comment while shortly before he passed away in 1933, after Hitler came to power that Eretz Israel would be safe. The Ponovezher Rav, Rav Cahaneman (sp?) heard this and bought the land the Ponovezh Yeshiva is located on in Benei Braq right when Rommel was advancing towards Eretz Israel and other Jews were trying to flee the country. A friend of mine's father was the only survivor in his family in Poland who was murdered in a German mass-shooting and shortly before it happened the Rav of the community assured his people that Eretz Israel would be spared. I also read in a book that Rav Elchanan Wasserman, who was one of the leading anti-Zionist Rabbincal leaders tried and unfortunately failed to get a visa to Eretz Israel when he was caught in the Soviet occupaton of Vilna (Lithuania) in 1940 (the Soviets invaded the Baltic States after France had been defeated), so we see that a lot of people did try to get to Eretz Israel in spite of the war. I think the tone of this post is insufficiently combative. As regards the slur of "Calvinist Judaism". Ignoring the obvious absurdity of the charge, there is some relevance. Every week I get a letter through my door telling me that if I donate money to some idlers (="tzaddkim") to recite tehillim on my behalf at midnight I will gain great prosperity and alleviate the condition of my dead relatives. The mania of Haredi Judaism to recreate all the worst elements of medieval Catholicsm (whilst, for example, making all sorts of childish games about making an addition sign, lest they make a "tzelem") is breathtaking. Ultimately, what most bothers me about this blog is that Rabbi Slifkin usually ends up reverting to some blather about how the mystical path and the rationalist one are two streams in Judaism that should co-exist in mutual respect. Yes, mystical Judaism has a long heritage. There's the egel masecha, then there was Nadav and Avihu, then generations of calf worshippers, Ba'al worshippers, people smoking incense on hills to Hashem's wife Ashera. There were Essenes and Sabbateans and Frankists. A long heritage indeed, and our job as Jews, in every generation, is to fight it with all our strength. I find Rabbi Wein's optimism about the future very impressive and meaningful. He also happens to describe the current situation very well. Getting out of the way is the prudent thing to do. If a man doesn't think his Gemara is a personal bullet-proof shield, that means he doesn't believe in the very concept of Divine protection or Hashgacha Pratis?! And I agree that the Torah study of hesdernikim is (at least) as useful in creating merit as the Torah study of kollel fellows. So too is the Torah study of middle-aged accountants and dentists. According to the gemara, ideal Torah study is balanced with "derech eretz". Jews weren't privy to supply line metrics, war strategies of both sides, etc. Jews certainly did not have the luxury of gathering all of the data after the fact, and typing out exhaustive studies that conclude that Rommel had no chance of taking Palestine after all. The question is: given the limited information they had, given the perceptions of that place and time (the period where there was still a possibility of escape), would you fault Jews for concluding that Palestine might be less safe than Europe? Given the Chevron massacre in 1929, given that the Grand Mufti made no secret of his wish to murder all Jews, etc., I think the answer is: no. It CERTAINLY would not be me who would look those dead Jews in the eye, so to speak, and say "I find it fascinating how pious Jews bend over backwards to find excuses not to live in Eretz Israel." Can we please not get off-topic. The claim is not that anyone else would have known better. It is that the Gedolim were not correct. Yes, mystical Judaism has a long heritage. There's the egel masecha, then there was Nadav and Avihu, then generations of calf worshippers, Ba'al worshippers, people smoking incense on hills to Hashem's wife Ashera. There were Essenes and Sabbateans and Frankists. Gavriel M, you're slipping. Where is the reference to the accursed lavan wearers and those that say Kol Nidre? What about the believers in astrology and alchemy? Is it is a religion if it has only one living member? Why stop there david? What about the entire bible full of holy men, Moshe, yehoshuah, Shmuel, yeshayah, king David and his prophet.... Nosson. I doubt Moshe wore a shtreimel but he certainty packed a miracle up his rebbish cane. "And it was when Moshe raised his hands and Israel overcame' and rashi - the people's attention was inspired to their Creator. The whole bible is a story of God's revelation and immanence; and His word spread by His anointed leaders. Or if you're from a miserabilist perspective, it's about whether there are ancient camel bones in Israel. Judaism has a societal and national and spiritual as well as intellectual dimension. It's all about balance. I'm far from uncritical of the monsters making a fat living from the credulity of their down trodden flock. I just wonder whether you are offering a sufficiently compelling alternative. David Oshie. Grow up. Kol Nidrei is a foolish practice that all reasonable people see should have been done away with hundreds of years ago, because the reason for its institution ceased hundreds of years ago. It's a completely stupid way to start a day dedicated to teshuva with a meaningless anachronism. It gives the message that Judaism is a fossil of purely archaeological interest, it pointlessly alienates people from Judaism, it pointlessly bores people, it pointlessly wastes time at the beginning of the service, it pointlessly gives ammnunition to anti-semites, and all for precisely nothing. It is not, however, an abomination that contradicts the fundamental message of the Torah. "Is it is a religion if it has only one living member?" Have you ever opened the Tanach? Read the Eliyahu story again, or any of the prophets. Try thinking about what you are reading. There is nothing remotely implausible about the belief that most Jews have strayed from the Torah. Indeed, given that even you, would admit that being mehalel Shabbat is to stray from the Torah, everyone agree that, at present, most Jews have abandoned the Torah. The question is only whether it's closer to 80% or 90%. Of course, Haredim evade this fact by (I) logic-chopping and arbitrary definitions and (ii) rewriting Jewish history as a fairy tale. But for sane people, the point is clear: the majority of Jews can be wrong, they have been before, they are now, and they probably will be again in the future. Apparently you can't tell the difference between belief in, love of and fear of one G-d and witchcraft. You don't see the difference between a prophet sent to rebuke the people for their sins, and a Rebbe who gives out magic Shemira coins. That's sad, and an indictment of whoever taught you. but it is not actually an argument. The bottom line is that there was never a Nazi threat to Eretz Yisrael. You missed Rashid Ali and the Golden Dawn in Mesopotamia. Also dealt with pretty fast by the Allies. 2) What you call a pointless waste of time actually serves an important practical function. Mincha has ideally been said earlier, so Kol Nidre serves as a starting point for the Yom Kippur service that would otherwise be missing. Having people stream in for Maariv after the start of Yom Kippur would be a much less ideal experience, IMO. 3) You assert, without basis, that it is completely in opposition to the purpose of the day. Nothing could be further from the truth. We are beseeching God for Kaparah that, in great part, we don't deserve. Every year, we make resolutions and commitments for improvement which we invariably don't keep in full. It makes perfect sense that we start by asking God not to judge us based on our commitments to Him from the prior year. If you take hyper-halachic interpretation of the custom, then of course, like Bilam, you will fail to see the obvious. (I am not asserting you are Bilam, I'm just making an analogy). But, even if you don't like my fairly non-imaginative interpretations, my larger point holds. Kol Nidre is universally accepted today (or as close as anything can be universally accepted). If it doesn't meet your threshold for Jewish practice, then you're living in a different religion. Best wishes for success in your endeavor to found one. You dodged most of the question. Are astrology and alchemy forms of idolatrous mysticism? Lavan wearing? Indeed, given that even you, would admit that being mehalel Shabbat is to stray from the Torah, everyone agree that, at present, most Jews have abandoned the Torah. The question is only whether it's closer to 80% or 90%. Most of the 90% or whatever of non-Shabbos keeping Jews don't assert that they are observing Judaism in that part of their lives. The consequences of your assertion is that >90% of Jews who are Shomer Shabbos are actually idolaters. David Ohsie, once again you are too busy luxuriating in your sophistication to read what other people say and so produce a canned argument with no relevance. I did not say that the message of Kol Nidrei is opposite to that of Yom Kippur (though plenty of Rishonim did say this, so you can save your Bilaam remarks for them), I said it is a pointless anachronism. The reason this is so is because they only convincing reasons posited for including it no longer apply. The proportion of people who either (i) make rash vows or (ii) have been forced by gentiles to make vows in the average modern congregation hovers around 0%. There is simply no reason for maintaining this part of the service. The only reason it is maintained is because of halachic paralysis. It's like still insisting on mayim shelanu: it's not evil it's just really dumb and, for that reason, is a bad way to start Yom Kippur. Now, as to why many people like it, the answer is obvious: it sounds like a spell and people like spells. This can easily be tested. Next Yom Kippur take a survey of ten people: first ask them if they found Kol Nidrei "moving" or "meaningful"; if they say yes, turn to the page in their machzor, cover up the translation (where relevant) and ask them to translate. It's a melancholy fact that millions of Jews find Shemohe Esrei, k'riat shema etc. completely unengaging, and only find Kaddish inspiring. And the worst bit is that this is not in spite of the fact that they don't understand what they are saying, but because of it. Fortunately in our age, no-one outside university departments reads Shiur Komah, or the Book of Jubilees, or Enoch or the heichalot litearute. No-one has a pot in his house dedicated to Hashem's wife Ashera, no one goes up a mountain or in front of the nachash nechoshet to smoke incense because they are convinced that's what Hashem really wants. All these things happened because people of integrity were willing to stand up against the overwhelming majority of Jews of their age and tell them they were wrong, and G-d gave these people sufficient authority to make a difference. Please G-d, in 500 years no-one will read the Zohar or the Tanya or kitvei Ari. When future historians write the story of how that happened, people like you making sarcastic remarks won't be a part of it. That aside, your argument really comes down to the claim that if Jews claim to be frum they can't possibly have fundamentally perverted Judaism. This is so staggeringly inane on its face, that it is hardly worth dealing with. It is contradicted, quite literally, on every other page of the Tanach. It doesn't even make sense. However, since you insist on bringing up the issue of tzitzit I wil use it to prove the point. Every day, observant Jews read 2-4 times that they are commanded by the creator of the universe unambiguously to wear a tekhelet string on their garments. Nevertheless, the overwhelming majority of these Jews believe that they are not obligated to wear this string and a significant minority are convinced that doing so is a very bad idea indeed. QED. "Fortunately in our age, no-one outside university departments reads Shiur Komah, or the Book of Jubilees, or Enoch or the heichalot litearute." Also, a good chunk of davening today, is based on the Heichalot. David Ohsie, once again you are too busy luxuriating in your sophistication to read what other people say and so produce a canned argument with no relevance. This discussion was worth it just for that description of me alone :). I did not say that the message of Kol Nidrei is opposite to that of Yom Kippur (though plenty of Rishonim did say this, so you can save your Bilaam remarks for them), I said it is a pointless anachronism. Sorry, I misread "It's a completely stupid way to start a day dedicated to teshuva" to mean it was contrary to the purpose. In any case, my response address your "pointless" argument as well. Perhaps in that time and that place, they were correct. I don't know what they would say to today's Minhag. I previously pointed out this as an example of a practice that had "changed". I also do think that the practice may have been treated by previous authorities "hyper-halachically", but I was not alive then, so I certainly can't stand here and disagree with their reasoning in their time. What that would prove is that there are a lot of people who don't understand what they are saying, but that is true of all of Tefillah. But what about all the others who do understand? Anyhow, what is the alternative? Do we just recite the service and sing none of it? You seem to have a brief against enjoying singing in davening when the listener doesn't pay attention to the words. No one will argue with that. There is no "reason" stamped on a Minhag. We do have a different ceremony of Hataras Nedarim for those cases (or to cover for forgotten vows, etc). You need to stretch your mind and consider that there reasons other than the ones that you prefer so that you can continue your holy war against all your inferior and ignorant coreligionists. That aside, your argument really comes down to the claim that if Jews claim to be frum they can't possibly have fundamentally perverted Judaism. No, I argued that your objections to the modern Kol Nidre are weak, just as your racial theories are weak, but they suit the agenda of proving your own superiority. The fact that your theories make you the only religious Jew in the world is merely supporting evidence. But to argue the point a little further, the Rambam permitted "magical" cures that he believed were bunk because they were approved by earlier authorities, and he was not at all against attacking theories held by a large majority of his co-religionists. Can you explain how even the Rambam went so terribly wrong? Was he too swept up in the cult of the copper snake? Finally, could you answer about astrology and alchemy? Interesting little battle here. One is intrigued and not entirely opposed to Gavriel M's inquisitorial heresy-hunts, but being less of a fire-brand, timorously worries about their costs. In his years of shul crashings, Temujin noted that Kol Nidre tends to involve either a great cantorial performance, or seminars about its presumed mystical facets...i.e., claims that it says things it doesn't say at first glance...or, usually, both. One isn't fond of cantors (can't shake that churchy feeling) and has been to a number of such seminars, but must confess that the moment mysticism rears its fuzzy-woolly head, Temujin's threat-board lights up with red idiot-lights, indicating a cascading cognitive shut-down. Now, David Ohsie could have perhaps defended Kol Nidre better than as an intro piece to the Yom Kippur services, but one tends to side with him for the reason that tradition should not be stripped so readily, even if the rational reasons are sound, as Gavriel M argues. Especially when others on the other side of the spectrum are tinkering with the orders of services with frightening speed and efficiency and with no better justification than to hurry up the service so that the suffering congregation which has been heroically fasting since it woke up (with only a cup of coffee to keep one awake for the drive to the tempietto), can roar out of the parking lot and take advantage of the lunch specials in the neighboring restaurants. The Ba'al HaTanya entered the study of a certain misnaged. The misnaged used to keep a copy of the book Noam Elimelech, on the floor under his bench where he sat. The misnaged, realizing that both the Ba'al HaTanya and R. Elimelech were talmidim of the Maggid MiMezeritch, asked the Ba'al HaTanya what is R. Elimelech like. The Ba'al HaTanya replied,"R. Elimelech is so humble, that you could put him underneath your bench in place of his sefer, and he would respond no differently than his sefer does." The misnaged promptly picked up the sefer Noam Elimelech from the floor. 1) It is read in a language that most of the assembled do not understand. 2) Because of various incomplete tinkerings designed to deal with theological objectiosns to the practice, it is very unclear, even to those who understand Aramaic, what the text is actually talking about. Arguably, it makes no sense at all. 3) It mostly deals with types of vows that no member of the congregation has actually made. So what you end up with is the following: we start a day dedicated to Teshuva with a the chazzan chanting a prayer in a language no-one understands, expressing regret in obscure phrasing for vows that no-one in the congregation has actually made/will make. "We are beseeching God for Kaparah that, in great part, we don't deserve. Every year, we make resolutions and commitments for improvement which we invariably don't keep in full. It makes perfect sense that we start by asking God not to judge us based on our commitments to Him from the prior year." What normal, healthy people do when they want to express a particular idea is, y'know, write a prayer that actually expresses that idea. What a paralysed fossil religion does is take a prayer that is talking about something else entirely and pretend it is talking about what they want. A good analaogy is the Tisha b'av insertion to the tisha esrei. Obviously this prayer absolutely must be altered to reflect the fact that Yerushalayim is no longer waste and in the hands of gentiles. But people trapped in amber cannot do that so they come up with inane and absurd re-readings to make them feel better about saying words (to G-d!!!!!) that they perfectly well know are completely not true. I have discussed with various people why we still say Kol Nidrei and have found that answers fall into 2 camps. (1) They agree it should be changed, but are petrified of Reform, (2) it has literally never occurred to them that the service can be changed. Now, though halachic paralysis and mysticism are not unconnected issues (for in reality the reason why halacha is paralysed is largely because of mysticism (not the Wittgensteinian Briskism that American MO types use to balm their conscience and numb their brain), they are distinct issues, and I want only to talk about mysticism here. Anyway, to answer your questions. I read the Rambam as being much more radical than you. On the other hand it is certainly true that, to an extent he pursued an esoteric approach to his attempt to purge Judaism of pagan elements. If you must know, I do think this approach is incorrect. Even if it were correct, however, I do not think it would work nowadays. If you want to know why the Rambam was willing to abandon(and he was) the vast majority of Jews to eternal oblivion, at least in the short term, then, basically, the answer is because (a) he was very pessimistic and (b) he was influenced by Platonic ideas of esotericism. In any case, the Rambam achieved a hell of a lot. As I said: no-one reads Shiur Komah now, no-one reads Heichalot literature, no-one says spells to Mercury. For a long time demons and withcraft fell substantially out of Jewish practice. This is all basically down to him. From Moshe to Moshe there was no-one like Moshe. In answer to you other question. Yes astrology is contrary to the Torah, as is discussed at some length by Isaiah. Yes, to anticipate your next move, it is obviously true that the chachamim of Bavel to some extent absorbed undesirable pagan influences. No this does not mean we can do away with the Talmud Bavli. Yes it does mean we have to be more cautious, especially with regard to the later material, than with the Mishnah or Yerushalmi. Yes, it is true that in the pre-modern age astronomy and astrology were not demarcated and, yes, in as much as it is tenable we should judge out forebears creditably as having been involved in the former. "Perhaps in that time and that place, they were correct. I don't know what they would say to today's Minhag. I previously pointed out this as an example of a practice that had "changed". I also do think that the practice may have been treated by previous authorities "hyper-halachically", but I was not alive then, so I certainly can't stand here and disagree with their reasoning in their time." Best I can tell it means "I am embarrassed by castigating views that were espoused by Rishonim, so I will simply assert that things have changed so radically that when they said something it may have been true, but when Gavriel M says the same thing (though, in fact, he didn't) it is not only untrue, but actually outside Judaism. There's really not so much difference between you and Meiselman when it's all said and done. What normal, healthy people do when they want to express a particular idea is, y'know, write a prayer that actually expresses that idea. What a paralysed fossil religion does is take a prayer that is talking about something else entirely and pretend it is talking about what they want. OK, so we have 50% agreement :). I would disagree with your point about what normal, healthy people would do. Normal healthy people desire ritual and can find new meanings in existing rituals. A certain amount of conservatism is built into us and can be seen in our art, our fashion, our athletic competitions, our gestures of politeness and in many other areas of life. So even if we could all agree to a "better" ritual than Kol Nidre (which we could not, so the common ritual is one value that you lose under your scheme), we don't know whether that ritual would be as motivating and meaningful as an older one, even if the words are not the ones you would have come up with from scratch. In addition, the best art and ritual is complex and embodies multiple elements and references simultaneously. I believe that the Halachic form of the ritual which is rooted in the notion of actual Hataras Nedarim that we still do before R"H and Y"K adds to the meaning. So basically I disagree with your aesthetics, but I don't know to settle that, other than to say that other people seem to like Kol Nidre too. Also, you seem to be arguing for complete radicalism in religion, in order to return to your conception Judaism's pure roots. There is a degree to which I agree with you; obviously, the religion is intended to have some for mechanism for change (e.g. Sanhendrin) that can do things like come up with a new calendar to suit new circumstances, extend debts beyond the seven year window, mandate monogamy, permit the education of women, etc. But even then, there is some level of conservatism and common decision making which is not always going to suit your view of what should be done. Conservatism is built into the system. Do you really thing, for example, that if a Sandhedrin was re-established today, that the results would be to your liking? A good analaogy is the Tisha b'av insertion to the tisha esrei. Obviously this prayer absolutely must be altered to reflect the fact that Yerushalayim is no longer waste and in the hands of gentiles. But people trapped in amber cannot do that so they come up with inane and absurd re-readings to make them feel better about saying words (to G-d!!!!!) that they perfectly well know are completely not true. People can ascribe new meaning to old words. I'm sure that you, of all people, are quite eager to change the way that Yerushalayim and the Temple Mount are treated. Unfortunatly, the only alternative today would be to give up on a shared liturgy. You left out the what is probably the majority camp: they've already replaced it with some other prayer. I like it the way that it is. I think that the reason is that we don't have an agreed way to make changes as we are supposed to have. Agreement on 50% then. Anyway, to answer your questions. I read the Rambam as being much more radical than you. On the other hand it is certainly true that, to an extent he pursued an esoteric approach to his attempt to purge Judaism of pagan elements. If you must know, I do think this approach is incorrect. OK, so if think that the Rambam didn't go far enough, perhaps you can understand why you might be considered "out there" in your opinions, whether or not they are right or wrong. Yes, you know what I was getting at, and I would go further and say that many Rishonim believed in astrology as well. My point is that if you are correct, then basically all is lost. You are trying to reconstruct some ancient ur-religion using what you consider to be an unreliable transmission. You misunderstand me. I dispute your views about how bad everyone else is for not agreeing with you. You might be right that we would be better off with a different Kol Nidre and I myself have unintentionally upset people by pointing out to them that it was not universally accepted in the past as it is now. I truly don't know what the those Gaonim/Rishonim would say today given the fact that people are not confusing it with a halachic act, it almost certainly no longer engenders increased anti-semitism, and it has been universally accepted by all authorities for some time now. Would Rav Karo oppose Kapparot today? Maybe or maybe not. Would he call us Emori followers for doing it? Probably not. (I don't like the modern Kapparot in the US because it is cruel to the chickens but that is something else). If you want me to disagree with Rishonim and earlier, here is one place: I don't believe in the apologetics around "Nashim Daatan Kalos" and I think that they were simply mistaken due to sociological circumstances. But that probably won't count for you, since I'm just expressing my "left-wing" views. The feeling is mutual :). You and Charedim have each staked out the high ground by your own respective lights and the rest are damned. David Ohsie, I will leave a few short remarks before this thread disappears into the ether. 1) I don't agree that tefillah is a "ritual". This may lie at the heart of our basic disagreement. 2) The loss of a common liturgy doesn't bother me. Ideally every shul would have its own liturgy designed to meet the needs of its congregants. Everyone should use his own words to pray; if they cannot do so in Hebrew, they should learn, but in the meantime they should use English. 3) I hope I am not not be misunderstood as attacking singing in Shul. Indeed, there should be much more of it, IMHO. I don't like Hazzanut and, to be honest, I don't think most people do either. Again, however, this is a decision for each shul. 4) What I said was that I don't agree with the Rambam's esoteric approach. In other areas however, I am far less radical than him. I don't, for example, think that you have to practice fairly extreme sexual ascetism to have a decent relationship with G-d, as he did. I'm not even sure I think it's preferable. I advocate a fairly minimum baseline: do what Hashem commanded you, keep far from avoda zarah. I think pretty much everyone can keep to that. That may be why, superficially I appear more radical than the Rambam. 5) Idle speculation about what Rishonim would say if they were here now, seems perlilously close to the Haredi approach of shamelessly re-interpreting them fit in with contemporary norms. Nevertheless, I suspect on this instance you are correct. If Yosef Caro was here today, I suspect he would not only permit kapparot, but mandate it. However, I am equally sure that the Rambam would forbid it. I go with the Rambam. 6) I think the evidence generally suggests that women have an average IQ the same or slightly higher than men. If you take a group of people and don't educate them it's hardly surprising that their da'at is a bit kal. So the Rishonim weren't exactly mistaken, they were just being circular. 7) You have the Sanhedrin point the wrong way round. Until people think like me, there won't be a Sanhedrin. And, when they do, I will therefore be happy with the results :). 8) Sometimes, I do indeed think the situation is hopeless. However, what am I supposed to do, simply pretend that we do have a functioning mesorah that we can rely on? The example of the Zohar alone proves without any shadow of a doubt that this is not the case. So what can we do? We do the best we can with the sources we have left to us. This is why the Mishnah, tosefta, midr'shei halacha and Talmudim were written down - not so we can simply ignore what they say, but so we can use them when we've gone off track. I don't think you should be so judgemental. Most human beings cannot concentrate on prayer for hours on end. Some people can and they should be free too, most people can't and they shouldn't be made to. Many, many frei people simply feel that normative Judaism makes unreasonable and meaningless demands upon them and we should not simply dismiss their feelings, not least because, at least if we are to judge by Hazal's standards, they are substantially correct.